Luxury is not a mere status symbol these days but it’s to encounter the feeling of freedom and inspiration. This is what exactly the TRIP suitcase is designed to offer you. Travelteq TRIP suitcase is based on a innovative lifestyle that retains your individuality at all times. Travelteq TRIP is not just an ordinary travel case but it is a flexible and versatile package that is small enough to be stored in the overhead compartment of a plane, yet big enough to create the highest amount of comfort you need. 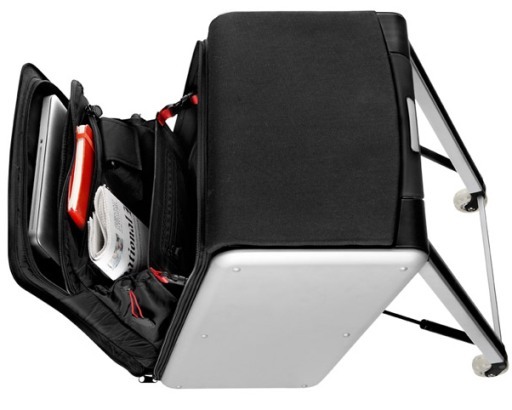 The TRIP travel case can be easily transformed into chair that provides you the comfort to relax and work in any situation, even in airports, subways, railway stations and parks. With its unique Dutch design and uncompromising durability, the TRIP travel case can make your journey more comfortable than ever. And adding to the comfort zone is its Intelligent design which includes a smart kangaroo compartment that allows you to get to your laptop, notebook, phone, newspapers and pencils with ease, without having to open the entire case. The intelligence of the TRIP suitcase doesn’t stop there, as it also boasts a custom integrated sound system with top quality speaks that enables you to listen to your favorite music tracks in the comfort of your hotel room. And all it takes to remove them when not in use is simply unplug them and remove from the case.